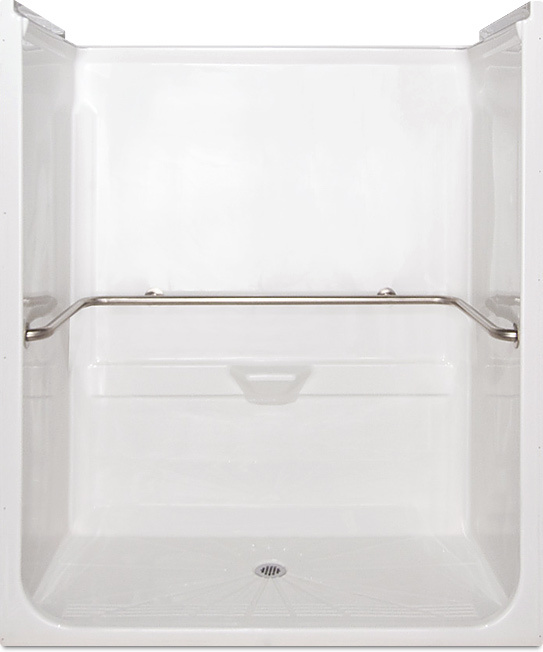 Aqua Bath’s Roll-In Shower Stall is molded from a single sheet of Lucite® cast acrylic without any joints or seams. The advantages of this one-piece construction is greater rigidity, lessens pre-installation damage, cuts costly maintenance and best of all, there isn’t places for mold to grow. The enclosure inside dimensions are 60″ wide x 36″ deep x 78″ height. The outside dimensions are 65″ wide x 37″ deep x 84″ height. The unit should have a backside flame spread of less than 30 (class B). A soap tray is molded in the center of the back wall 24″ above the floor. The unit is formed with a patented recessed trench system that directs water to center drain. The approximate weight of the unit is 275 pounds. Meets ANSI Z124.2, ADA Guidelines as well as other standards for accessibility and NAHB (National Association of Home Builders) listed. Unit has a backside flame spread of less than 30 (class B). Please call 1.800.232.2284 to find an Aqua Bath sales reps in your area or click here for your state.